Second half goals see AFC Bournemouth lose for the first time this season as they go down 2-0 away at Chelsea. Despite Marcos Alonso hitting the woodwork, it remained goalless at the break, both sides making chances in the second period before Pedro finished well from 18 yards following some good combination play. In the closing stages Eden Hazard added a Chelsea second as he waltzed into the box and exchanged passes before slotting home and ending the visiting hopes. After impressing midweek in the Carabao Cup, there were Premier League debuts for summer signings Jefferson Lerma and Diego Rico, Eddie Howe switching to three at the back in the capital. The game was open from the outset, Callum Wilson almost getting in front of David Luiz to meet a cross, while Asmir Begovic made two sharp saves following a corner to thwart two quick-fire Willian shots. Antonio Rudiger headed over as the hosts looked to take control, but when Joshua King stole the ball on halfway the Cherries' front three flew forwards and Fraser was within a whisker of connecting with the Norwegian's pass; Dan Gosling soon firing off target from the corner that followed. The Chelsea attacks kept coming, Jorginho dragging an effort wide, before King released Rico down the left flank. The full-back's wicked ball bounced in front of the free Wilson, but he could only direct over the bar from eight yards. Steve Cook made heroic blocks to keep out first Mateo Kovacic and a minute later Alvaro Morata as the Cherries looked to keep parity, Alonso hitting the inside of Begovic's post - via a Lerma deflection - just before the break as the players headed in all square. The second period began with Chelsea piling the pressure on, Begovic making a fine save to deny Alonso as the rampaging Blues full-back again found room in a threatening area. Then on 57 minutes the visitors had the best chance of the game. Rico's free-kick was headed behind, the corner soon swung in and diverted over by Nathan Ake's outstretched boot from within a metre or two of the goal line. The boisterous away support sensed a swing in the momentum, Lerma shooting high and wide from the edge of the box. However, with 20 minutes remaining, Chelsea snatched the lead. The substitutes combined as Oliver Giroud paced into the area and fed back to Pedro, the World Cup-winner showed his class to step past his defender and bury a confident shot into the bottom corner. Fraser was set free by Gosling as the Scot got the run on the last man, but he snatched at his early effort and it flew well wide. Lys Mousset and Jordon Ibe entered the fray together as the Cherries looked for an equaliser, and despite some promising build-up play from the away side, Chelsea had a second five minutes before the end. Hazard was in the thick of it, playing a one-two with Alonso which he was then able to clinically finish to double the task faced by Bournemouth. Live wire Fraser again went close as he curled a dipping shot just wide of the far post, though an unlikely late comeback evaded the Cherries as they fell to their first loss of 2018/19. 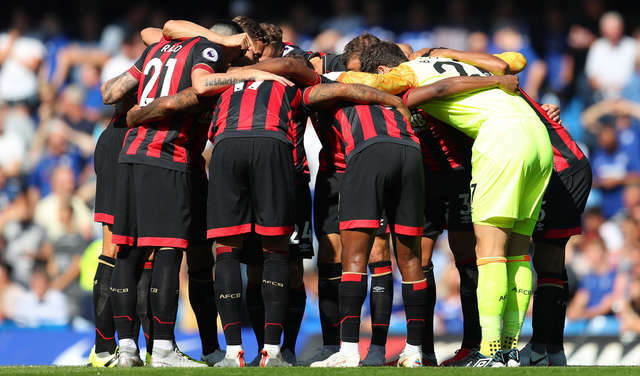 For the first time this season, Bournemouth switched both personnel and their approach for the match at Stamford Bridge. Howe moved to a back three which led to an increased defensive stability, with the pace of King, Wilson and Fraser creating problems when the Cherries won the ball back. The double change ten minutes from time saw the visitors revert to four at the back in the quest for an equaliser, an effort undone by Hazard's magic. Away at a top-six side, Begovic was always likely to in for a busy afternoon, the Bosnian doing a solid job, making not just a number of key and impressive saves, but also commanding his area and showing his handling skills to calm Chelsea's attacking play.